Peacefully at ‘Paretai,” Mangateretere, on January 26, 1983, loved husband of Doris, dearly loved father of Ann (Mrs Verberkt, Sydney), and Michael, loved Grandfather of Rosalind (Sydney), Juliet and Suzanna (London), and Michael Verberkt (Sydney). 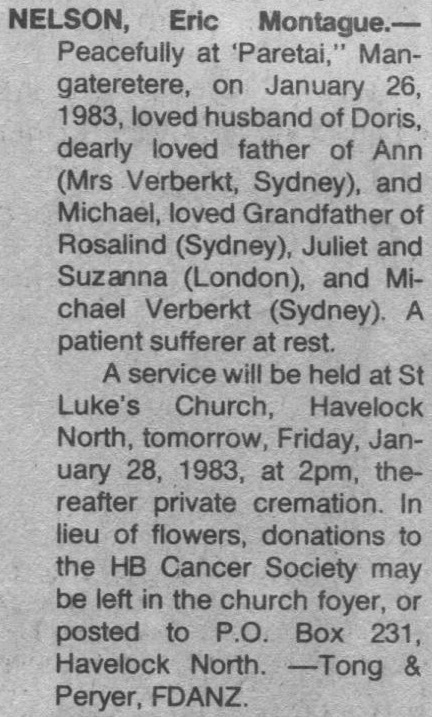 A service will be held at St Luke’s Church, Havelock North, tomorrow, Friday, January 28, 1983, at 2pm, thereafter private cremation. In lieu of flowers, donations to the HB Cancer Society may be left in the church foyer, or posted to P.O. Box 231, Havelock North.